3. Work in high efficiency combined with lift platform. 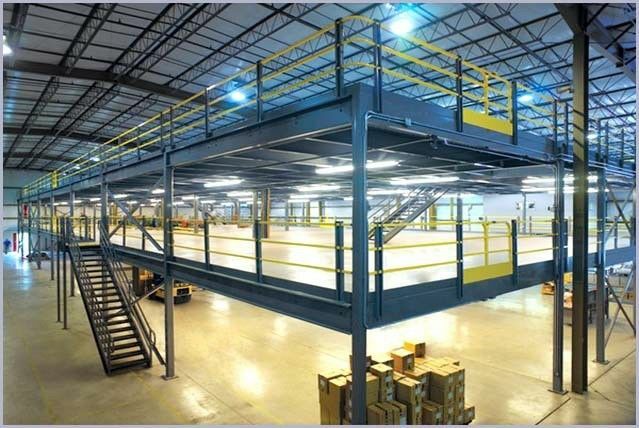 4.The advantage of the Mezzanine floor racking is safe, good looking& removable. 1. The most commonly used, of all storage systems for palletised goods. Low capital cost. 2. Easy installation and simple to adjust. 3. Compatible with most types of handling equipment. 4. Less storage density compared to other pallet racking systems. 5. Infinitely adjustable and offering a wide range of options and components. 6. Maximizes space use in any warehouse configuration while retaining optimum product accessibility. 7. quality garantee 3 years. 8. More than 300 workers enable us to garantee the delivery time , normal orders witin 20days. B) The size of Mezzanine. C) The size of Mezzanine rack(length*width*height). D) How many bays you want. E) How many layers you want. F) The loading capacity of each layer. G) The RAL color you want.